What is a Sky Booster?. The Sky Booster, otherwise known as the. Sky Q WiFi booster. Sky plus Hd WiFi drx895w 2tb model. Get Free Quotes. 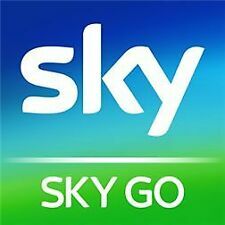 New listingSky Go (12 Months) Full Package *Trusted Seller* Over 160 sold..
SKY GO Accounts covered for 12 months. 1 x Sky SD501 Wireless Connector. Mini WiFi Adapter for Sky HD. Includes adapter cable. 2TB WIFI 3D ON DEMAND BOX. This is the top of the range 2TB version and was the latest and last box to be released before Sky Q was released, You cannot buy these new anymore and are becoming more and more rare so grab while you can. SKY Go Extra Accounts covered for 12 months. Includes Sports and box sets. 500GB Internal storage. 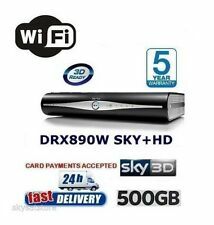 2016/2017 Sky HD Box with Built in wi-fi Model DRX890-W. You will not be able to receive paid for subscription channels or pause and record TV without a Sky service contract. Original Sky Box. Condition is Used. Dispatched with Royal Mail 1st Class. sky HD box - Just Box, Remote Not Included. Condition is Used. Dispatched with Royal Mail 1st Class. NEW Sky Q Wireless/ Wi-Fi Booster * with leads *. LATEST VERSION!!! Dispatched with Royal Mail 1st Class. Sky plus hd 2tb box, remote and power lead. This box is in excellent condition and gives you all you need from a Sky box. Model no DRX595. Sky Multiroom Box. You will not be able to receive paid for subscription channels without a Sky service contract. Sky DRX895W 2TB HD Digi Box. In very good condition, no marks or scratches, any questions please ask. 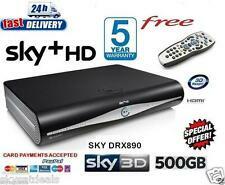 Sky Hd Box Drx890 3D-On Demand Compatible.500GB.HDD remote HDMI power cable and viewing card. A VALID SKY SUBSCRIPTION IS REQUIRED TO USE THE SKY PLUS FEATURES,recording. This HD BOX YOU WILL. ALSO RECEIVE OVER 8 FREE HD CHANNELS;. 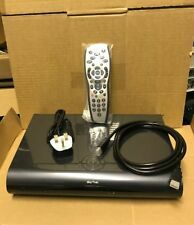 NWSky Q box 1tb in excellent working condition UK comes with remote and HDMI . Condition is Seller refurbished. Dispatched with Royal Mail 1st Class. Sky DRX895WL 2TB HD Digi Box. Includes Remote Control Condition is Used. Fully working as of today when disconnected due to upgrade to Sky Q. No guarantees so please be sure it meets your needs before buying. Non payers will be reported to Ebay as fed up with time wasters. Paypal only. Collection in person only. Sky DRX890 Sky HD Wi-Fi Dongle. Condition is Used. Fully working when disconnected today due to upgrade to Sky Q. No guarantees so please be sure it meets your needs before buying. Includes Remote Control. Paypal only Buyer collection only. Non payers will be reported to Ebay as fed up with time wasters. It's missing the little flip-down part that covers the Sky card but this doesn't affect how the box works at all. Box only, no remote or power cable. The box has been tested, cleaned and works perfectly. Sky Digibox. Condition is Used. Dispatched with Royal Mail 2nd Class. 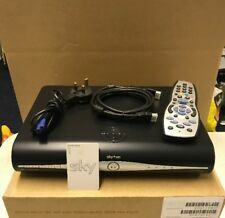 Sky DRX890 -C Sky HD 500GB Set-Top Box/wireless connector/ remote/viewing card/HDMI cable. Condition is used with circular blemish on top. Was used as a multiroom box and comes complete with a viewing card. I have other Sky equipment for sale, so please take a look, and would be happy to sell as a bundle. Price to be negotiated. SKY MINI WIRELESS CONNECTOR BOX SD501 guarranteed. Condition is Used. Dispatched with Royal Mail 2nd Class. You will receive 1 x Sky Box DRX890w and 1 x power cord. Condition is Used. C o m e s w i t h r e m o t e a n d l e a d s, n o original b o x b u t w i l l b e b o x e d f o r p o s t i n g, 2 available, t hi s li st in g is f or 1. SKY ON DEMAND WIRELESS CONNECTOR/ADAPTOR ! INCLUDES:- WIRELESS CONNECTOR, POWER CABLE, ETHERNET CABLE ! THIS ITEM IS IN GREAT CONDITION ! Sky DRX895 Sky HD 2TB Digibox Features: - Sky HD Digibox with massive 2TB 7200RPM SATA hard drive (1.5TB for personal storage) - Sleek, sophisticated design with a lacquered, gloss finish - Six times more personal storage than our Sky HD box - 1.5TB of space to record Sky TV - 500GB of space for a selection on demand TV ready to watch - Record up to 350 hours of HD TV – that’s enough for two weeks' worth of HD TV - Or up to 1180 hours of standard TV – that’s nearly 50 days of TV I purchased this upgraded box for £199 on release, it is in excellent working condition. Dispatched with Royal Mail 1st Class signed. 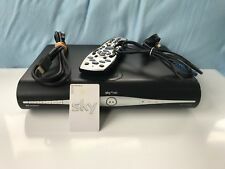 Sky 2Tb HD Digi Box in very good condition. A Sky box is a unit connected to a TV in order to receive a Sky signal. With a Sky signal, you can get up to 300 channels on your TV. This kind of box, available on eBay, can be used as a satellite box as well, so you can receive satellite signal or free-to-air TV service. What is included in a Sky box package? What are the features of Sky box? 2 in 1 box – It can be used as a satellite receiver and a personal video recorder. Has dual tuners – It means you can do two things simultaneously; it can record a TV program while you are watching a different TV program. Comes with EPG – You can view its Electronic Programme Guide for 7 days, so you can easily decide whether to record a programme or watch it live. HD capable – Check if your Sky box is HD capable or not. What is the available memory capacity of Sky box? If you search for affordable Sky receiver on eBay, you can find a lot of versions available. Each version has different features. For example, not all Sky receivers can rewind and pause live TV, and not all Sky box has the same memory capacity. Here is the different memory capacity of Sky boxes. What is Sky On-Demand box? A Sky On-Demand box is a box that is capable of handling On-Demand programs through Sky Anytime. Aside from a Sky Anytime subscription, you should also have an internet connection in order to use this box. If you are into On-Demand programs like rare boxing fights or programs, you should check if your box is On-Demand capable. Sky On-Demand box is also HD capable. 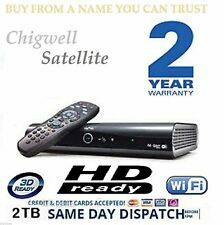 If you search for it on eBay, you will find a number of these Sky box at very affordable prices. Content provided for informational purposes only. eBay is not affiliated with or endorsed by Sky.